Exploring beach volleyball history and origins. Don't let the fact that beach volleyball is one of the newer Olympic sports fool. The truth of the matter is that history of beach volleyball stretches much further into the past than many fans and players realize. This gutsy, barefooted game got its start in the 1920s and has enjoyed a steady climb into the international spotlight ever since. Since it sprang onto the scene, beach volleyball has given rise to a number of stars that have added to the sport's appeal. Legends like Karch Kiraly, Randy Stoklos, Sinjin Smith and Ron van Hagen, made the game fun to follow and fascinating to watch. As their careers grew, so did the popularity of this sport. 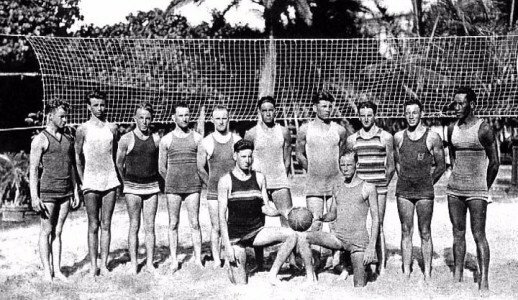 While 1920 is the official birthday credited in the history of beach volleyball, the sport does trace its origins further back in time. It is written beach volleyball was most likely played first time in Hawaii 1915 on Waikiki Beach. American William G. Morgan is said to have created the "root" game in 1895 during his time as the physical director for the Holyoke YMCA. The game, which was then known as Mintonette, was a hybrid of basketball, tennis, handball and badminton. The name was changed to volleyball as it started to spread around the globe. For those who don't know, beach volleyball is a game that is played on a sand court that is divided by a net. While pickup games on beaches can involve a number of players, the official sport, as it's played today, calls for two teams of two players each. The game on the Olympic level is played as a best-out-of-three set competition. The first two sets play to 21 points with the third, or tie-breaker, played to 15. Sets must be won by two points to count. Santa Monica, California in United States is the site of the official birthplace of the beach version of this game. It has gone down in the history of beach volleyball that in 1920, the first volleyball courts were set up on a beach. By 1930, the first two-man games of beach volleyball were being played in Santa Monica and the sport began to gain international appeal with games recorded in Bulgaria, France, Latvia and even the Czech Republic. By the 1940s, a more organized version of beach volleyball began to appear. The first official two-man tournament took place at State Beach in 1947 without a prize on the line. The stakes rose in 1948 when State Beach again hosted a tournament with a case of soda on the line for the winners. During the 1930s and 1940s, the sport began to rise in popularity outside of organized circles, as well. It is said that six on six games were not at all uncommon and that the minimal amount of gear needed for this game made it really appeal. Beach volleyball took a major leap forward in the 1950s when the first circuit of tournament play was established in California. The beaches that took part in the circuit included Santa Barbara, State, Corona del Mar, San Diego and Laguna. By the 1960s, beach volleyball became entwined in the California lifestyle ideal. The sport was as much a part of the mystique of this state as surfing. The game continued to rise in popularity through the years. By the 1990s, it had grown to have major international recognition with federations all over the world. Beach volleyball took a massive step forward in 1996 when the sport become an Olympic sport in the Atlanta Olympic Games. Growth of Beach Volleyball continues today as a sport is on the rise all over the world. Commercial tournaments. World Champioships. Olympic Games.